Phew, it’s been a while since I’ve posted anything! Recently my time has been swallowed up with Statue restorations, cabinetry work as well as the restoration/refinishing of many pieces of furniture. It’s all in a days work. This project has been in the works for some time now and it finally hit the shop. These 12 panels are for a custom wine cabinet headed for a new beach house in Bermuda. The designer and home owner liked the motif of a screen panel and decided to use the images they found on it as a base for the panels for the cabinet. 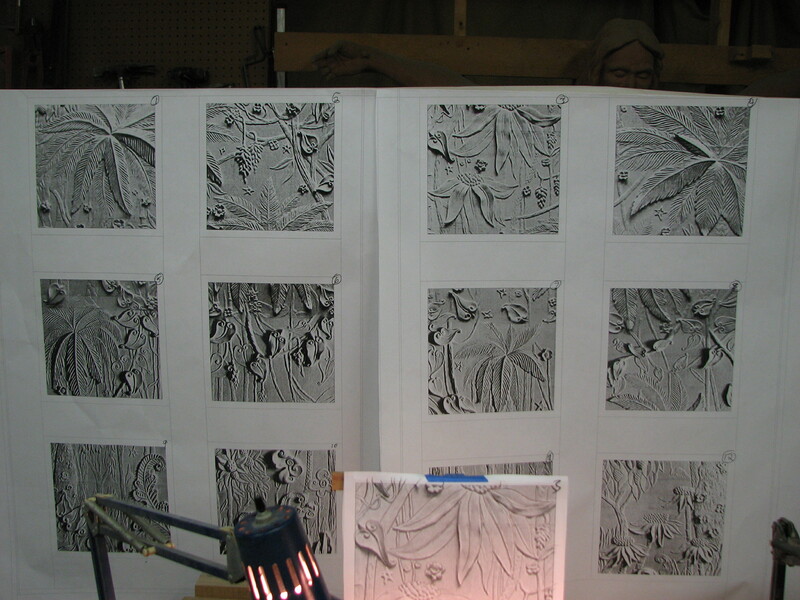 There are two doors on the cabinet and each will have 6 relief panels carved to fit into them. The only part of the job I have is to duplicate the images they decided on by carving them into the 9 inch square panels. The cabinet maker who is building the wine cabinet supplied me with the ready made panels which were fitted into the doors prior to him shipping them to me. They are rabbited to fit into the rails and styles of the doors and he gave me 1/4 inch to carve into. Fairly straight forward stuff, but no mistakes allowed as there are no extra panels. Well, if I had to it wouldn’t be a big deal to duplicate a panel or two should I make a mistake. Here you can see the large print out of all the panels with decent contrast. They also provided a second set of prints of lesser contrast that I used to simply trace the design on to the panels. I routed the panels to remove as much waste wood as possible before carving them. Since the panels were rabbeted I made a jig for my swivel carving stand to hold them securely. I used a piece of ply , made cleats that would allow the panels to slide into on three sides and just use a small clamp to keep them located in the jig. Now I can easily slide them in and out, rotate them, angle them to any position I require. I’m a big believer in having your work secure as it makes carving so much easier. I’m also a believer in proper lighting as the play of shadows is what makes a carving live. Where speed and ease of carving is concerned the method I prefer is to lay out my chisels within easy grasp and ranging from the flattest up to the deeper gouges and V’s. No need to worry about numbers or any of that other nonsense as if the tool you happen to be using is too flat,,replace it and just grab the tool next to it and keep on carving. I switch back and forth so often and so quickly that trying to put them into racks ,, or keep them in numerical sequence just isn’t worth it and only makes carving go slower. Here is the full size print out of the proposed panels. I hung them behind my bench for quick reference as well as mounting an individual copy directly behind the carving I’m working on. 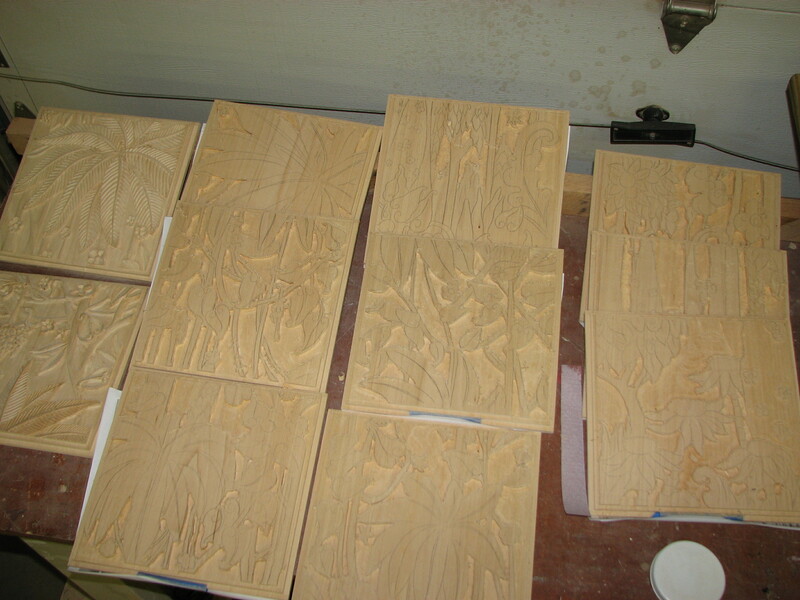 Here are the panels right after the routing process. I just want to get the waste wood out of the way as quickly as possible to be able to get to the carving. Two of the panels with the carving essentially done but not sanded. Very simple reliefs that fall within 1/4 inch. Not much to work with on a 9 inch panel. This is the jig I made to attach to my swivel carving stand. It’s simple and does the job of holding the panel securely and yet allows me to easily remove and install carvings as I finish them. This is the lower edge cleat. There are long cleats on the sides with the top left open allowing me to slide panels in and out. A small clamp keeps them in place. Here the panel isn’t slid all the way into the cleat. And the overall view of my work area. 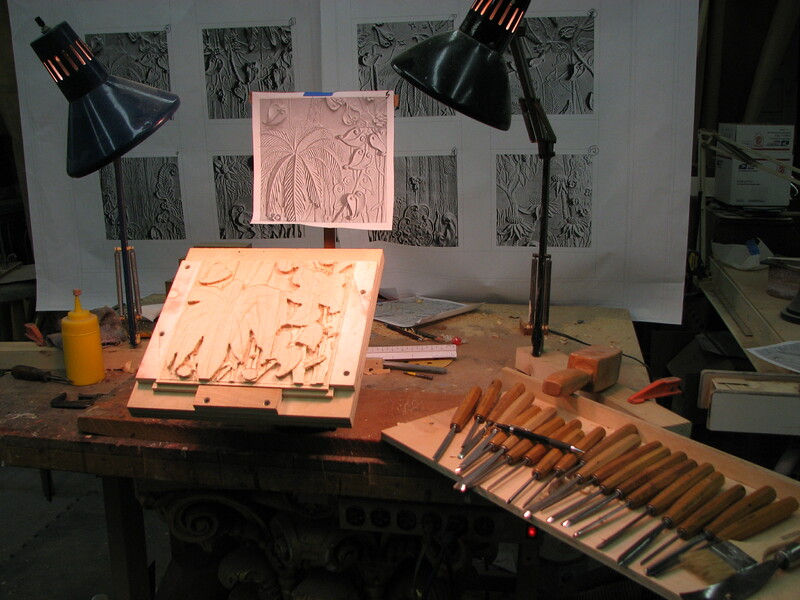 Two lights from opposite directions for proper lighting and shadows, tools laid out for easy and quick selection, prints hung for quick reference and direction all makes for easy and efficient carving. hi Mark, so glad to see you showing your work again ! 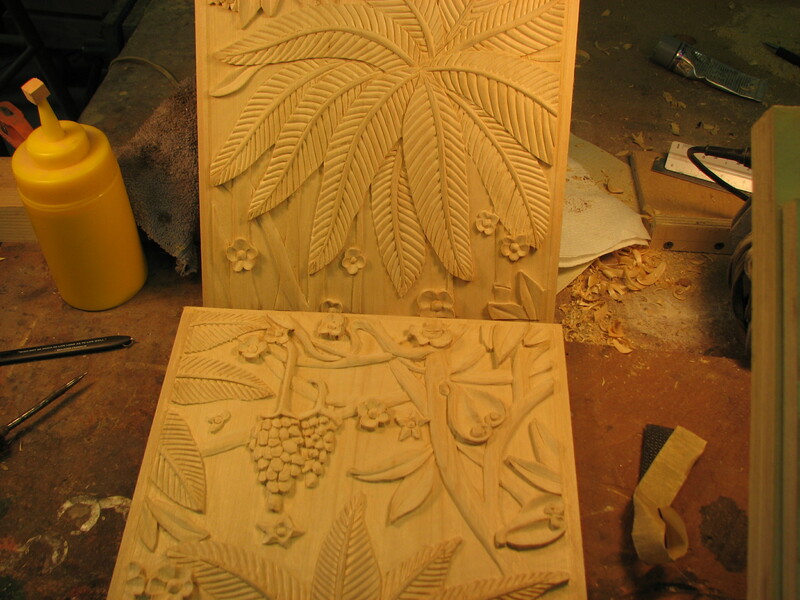 what a neat project to share, looks like a lot fun leafs to carve. not an easy task in such little depth, but that makes the fun, at least to me 🙂 … my workspace looks very similar in moment, have the same sort of lamps, that i can arrange any time, to suit my needs. 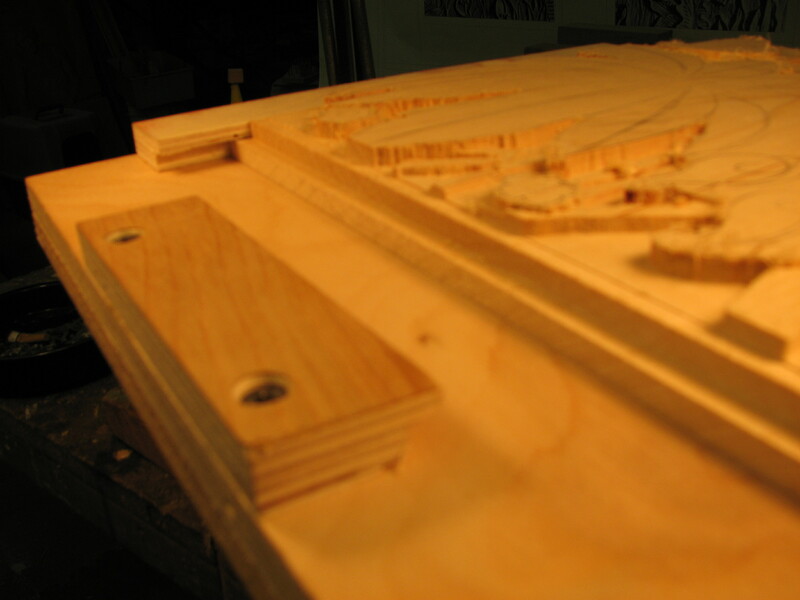 … the jig you made for holding the panels, i like that idea, and will copy it on next opportunity. always good to have no annoying clamps too close to the carving …i am looking forward to see all the panels finished, ha, as i know you you are half way through already ,,, and i imagine they will look great together… are you going to do the finish too, or does this the man who assemles the cabinets do ? I have always been a believer in arranging the work area, lighting etc. in a way to allow easy carving. Having the piece secure is of primary importance. I am nearly half way through with them at this time. I won’t have to finish the pieces as the guy who is building the rest of the cabinet will handle that job as he finishes the entire cabinet. They just ship me the wood, I carve it and ship it back. Okay, you’ve got me thinking again, Mark. How in the world do you find the courage to grab a router and remove waste wood by hand on panels that have no backup? You must have a very steady hand and lots of control with the router. If it were me doing that, I’d have to stay at least 1 inch away from the lines of the pattern. From the photos, it looks like you cleared out material within 1/16 of an inch of the pattern and in steps! With my skills, I would find all the ‘grab’ spots and end up in the pattern somewhere. Do you use a ‘palm router” with a ‘see through’ base? I’m really interested in the leaves with the raised center vein (3rd photo fro the top.) How were you able to carve those veins with such smoothness? Working with an inverted chisel from all directions? Every time I’ve tried to carve something similar, I end up not being able to reach some area without digging into the wood. I could continue guessing, but I’m sure there is a simple answer I’m overlooking. Maybe you used some of that magical flow paper? Really looking forward to the finished products. Hello Doug, thanks for the kind words. Where do I find the courage? In the fact that I’m basically lazy and in the interest of speed and time I’ll grab the router to hog out waste wood in a heartbeat. Why spend all that time not carving while just removing junk wood. Besides, the router leaves a nice even bottom surface to work from where a chisel would most likely leave it uneven and with tear outs in such confined spaces. I do use a trim router with a translucent base. I also made a base for my other routers out of 1/4 inch plexi, rather large in surface to span gaps in carvings such as these, and keep a firm grip on the two handles at all times. I also have bases where I enlarge the hole for a better view. I make my first plunge cut naturally in the center of a given area then gradually fan it out until I’m very close to the lines where I can just “brush” the bit against the line, being aware of the direction of cut since a router will pull itself into wood depending on the grain and direction of the spin of the router. Depending on the wood and the sharpness of the bit you can actually cut right to the lines. Basswood being fairly soft doesn’t leave a clean edge in most cases so I do keep a bit away from a line to be able to shear it with a chisel. That though doesn’t need to be done until the carving is nearly done otherwise you’d waste a lot of time shearing all those vertical edges. Also, start with the largest bit you can to remove most of the material. Why? They don’t grab and pull the router off line as quickly as a small bit will tend to do. Here I used a quarter inch bit before using an eighth inch bit to get into the little corners and such. Then , once the depth is set over all the panels I go back and just visually start raising the bit a little to cut down all the pieces that will be the most shallow in the design. With so many lines running every which way it’s easy to get confused so I use colored pencils prior to routing to indicate which lines will be at what depth. In such shallow carving with so little to remove I just kept it to 3 levels. Cleaning up the branches or whatever will remove what little I’d need to give the appearance of depth. I keep the large leafy branches untouched as here I can over their length make them undulate ( hard to see in the pics) over the length of a leaf/branch. It’s the dominant feature so the carving is more important here to support the illusion of depth and movement. Flat carvings are boring so whatever variations I can pull out in the 1/4 inch is important. On the leaf/branch in question the first step is to shape the entire “flow” of the piece. Then carve the center vein and lay down the sides allowing the vein to stand clear. I then sketch out the directions of the ribs as a general guide after sanding the surface to smooth it and remove the chisel marks. If I didn’t each of the ribs would show unevenness after carving them. This way, all the rib surfaces are smooth. Then I’ll make a quick shallow pass along the main vein with the edge of a chisel or the point of a skew at a slight bevel. This will allow the wood to pop free when I use the V tool to cut in all the ribs. Usually two passes for each rib. One from the vein to the edge of the branch, then the second back into the vein where it pops free because of the prior cut. I will on some areas blend the surfaces of the ribs here and there, but in this case I did make a quick pass with some paper, but they aren’t finished sanded in the photo. The branches did have minor sanding to remove any fuzzies for clarity sake, but the rest of the carving hasn’t been sanded at this point. Sharp tools on soft wood is very important. Especially when you are carving in all directions and at times you have to carve against the grain. One other thing about the router and removing waste wood. Here , the wood is soft and I’m only going in 1/4 inch. Even so, at times you can’t clearance it all in one pass at full depth. If it’s deep there is so much wood to remove at a greater depth that the router will want to pull and run amok. Do it in incremental passes where it’s easy to control the router. Then you won’t need a death grip on the machine and can actually guide it using just your fingertips and sculpt with it. Shallow cuts you can pull and push the router anywhere you want without it taking control of the cut. One full depth pass can spell disaster. 2-3 shallow cuts where you sneak up on the depth you want will lessen the chance of the router pulling itself into wood you want to keep. Again,, the direction of the spin of the router as well as the grain direction is very important in controlling the router. Feathering passes with the direction of spin usually works the best. Mark, you give me more Ah-ha moments than all my teachers combined! The larger bit makes sense – higher surface speed – less pull. I’ve got to try this – just for fun! And your explanation of the branch/vein and the leaves gives me hope for the future. I should remember what you and Doris taught in ‘Carving the form not the details’ and work the entire form before starting in on the details. Parting the branch from the leaf veins gives the advantage of being able to work on either one without interference. And as you mentioned, the wood pieces will pop out clean. Thanks for taking the time to give more instruction.